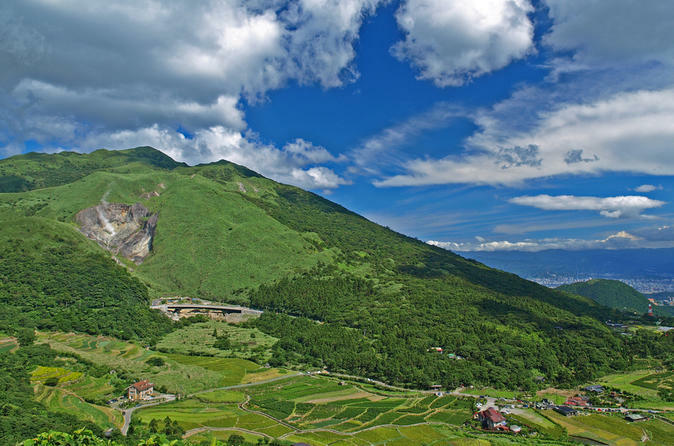 Taiwan is known for its gorgeous scenery. 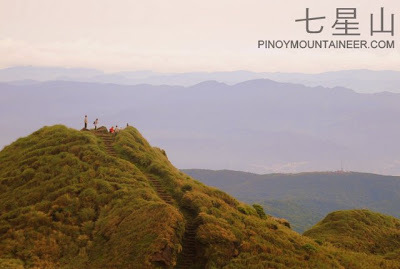 The ‘easy’ option for stunning mountain views, nearish to Taipei, was the famous Yangmingshan National Park. Courtesy of lonelyplanet. Beautiful, right!? Courtesy of Pinoymountaineer.com. Pretty cool, yeah? Well, in any case, I was wrong about ‘a little bit of drizzle not harming anyone’. Well, not wrong, but definitely not right either. Yeah, sure, cool, we were at a national park, awesome, but, well, let’s put it this way, a cloudologist would’ve had a whale of a time. ‘Here you can see the clear, spectacular view of Mount Qixing,’ boasted the signs at the viewpoints. We read the sign, looked at each other and agreed to disagree. No, here you can see the damp, foggy clouds of Mount Qixing. Yes, it was atmospheric. But no, there were no mountain views whatsoever. After a fifteen-minute wander in the damp sogginess on the empty roads of Yangmingshan national park, we finally reached our hike's 'starting point'. It'll be about a 40-minute hike, explained ever-efficient J who had everything mapped out on his smartphone. I seriously considered staying behind and sitting at the nice sheltered bus stop. I was in no way dressed for a foggy rainy mountain hike – neither were the guys, but they at least had some kind of rain coats and also today they had decided against wearing their heeled boots (not that I had much choice, you have limited options when you decide to take only carry-on for a three week trip!) I wasn't grumpy or sulky, no, but I feel I am old enough to know not to force myself through voluntary unhappiness. I mulled it over, then decided to go for it anyways since it looked a tiny percentage sunnier than it was a few minutes previously. After a long, damp climb of ridiculously steep and uneven steps, with I’m sure what was gallons of sweat pouring except you couldn’t really feel it because you were drenched throughout with fogginess, the friendly signpost informed us we’d done 100 metres out of the 1,400 metres. That was another point I seriously considered turning back. But alas, no, I perservered! We introduced ourselves to fumaroles, which are openings in the earth's crust that emit steam and gunge. Apparently if you inhale them too much it's bad for you. But, we reached the top, and we were happy! :D Photos were taken though not much of a view to be seen, surprisingly. It was soggy and effortful, but definitely worth it. And the steep steps... well, let's just say we'd be able skip the squats for the next ten years-ish after that workout. But obviously you don’t want super fit legs without a super fit top half, right!? Luckily Yangmingshan catered for those needs too – after our soggy hike, we caught the Most Packed Minibus Ever. Somehow we managed to squeeze in even when, before any of us had got on, the bus door clearly was going to have problems closing. Well, anyways, in that bus I practised my arm muscles by half-holding onto a railing trying my utmost not to fall, at every bend in the road, onto the tiny woman in front of me. It was a happy moment when we got back to civilisation, bought some steaming pork buns and a new pair of socks. Ah, it was so worth it. Reminds me of the time Äiti and I climbed the highest mountain on the Isle of Mull: we got an excellent view from the top... of the drizzle-soaked fog! But as you say, these things are worth it! Very nice toilet reading. Good leg training! Jee Tofu <3 Luepas vielä edelline entry niin vielä erinomaisempaa toilet readingii luota muhun!